FIREFIGHTERS from Kentish Town are scaling the country's biggest peaks to raise money for a colleague forced to retire through ill health. 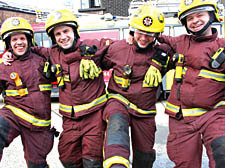 Red Watch officers will trek Scafell Pike, Ben Nevis and Snowdon in 24 hours to raise money for the Jon Bonney Benevolent Fund and the Firefighters Charity. To contribute to the fundraiser, visit www.justgiving.com/kt3peaks, or call 020 7587 4750 for further information.